Number of Books: 14 books in the classic Mr Majeika series; 2 books in the infinitely superior ‘The Television Adventures of Mr Majeika’ series. Availability: All of the 14 stories individually published by Puffin are widely available. Penguin has recently repackaged and released a box set; the 2 TV-series based books are available on Amazon and eBay. The Premise: In the 14 book series, Mr Majeika is a wizard who arrives on a magic carpet to teach Class Three at St Barty’s Academy, in the sleepy village of Much Barty. In the Television adventure series, Mr Majeika’s been banished from the Wizarding world of Walpurgis for failing his wizarding O-Levels 17 times, and must prove himself as a teacher in Britland before he can ever hope to return. The problem is that he can’t stop doing magic; all it takes is just one flick of his sticky-up tuft of hair. In both series’ mayhem, of course, ensues. Why I Really Like It: I loved these books – and the TV series – as a child. What kid didn’t want their teacher to secretly be a wizard? Mr Majeika’s heart is in the right place, but his knowledge of spells is somewhat basic and things always go wrong, with comic and unexpected consequences. He takes the Scouts camping, but isn’t aware that he’s meant to pitch the tent, not wear it. He wants to be the most helpful member of the community at the village fete, but he careers the tractor into a processional float, sending all the participants toppling into the duck pond. He accidentally turns a pupil into a frog, but can’t remember the spell to turn him back again...Plus, the class brat, nasty, spoilt Hamish Bigmore, constantly gets his comeuppance, which was always satisfying to read. 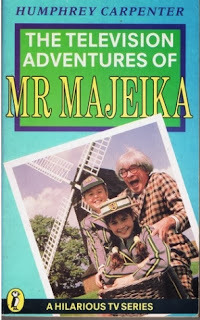 Best Book: Of all the 16, it’s got to be ‘The Television Adventures of Mr Majeika.’ I remember weeping with joy as a child when Mr Majeika’s finally allowed back into Walpurgis, but decides to stay in Britland with the friends that he’s made. Others by the Same Author: The TV series was written by Jenny McDade, a prolific scriptwriter who also created the classic children’s show ‘Supergran.’ As well as the ‘Mr Majeika’ series, Humphrey Carpenter wrote ‘The Oxford Companion to Children’s Literature’ and several biographies, including J.R.R. Tolkien, Ezra Pound and Spike Milligan. I just about remember the TV series, but I didn't realise there were books!